Remember the Clairol jingle from the 70s and 80s, “I’m gonna wash that gray right out of my hair?” Of course you do, you’re my Gray Girlfriend! Clairol’s Loving Care promised to help us hide to the gray; they promised to help us hide who we were because the message was “If you are not young, you are not good enough.” For DECADES, we bought into that lie. I saw my first gray hair in my early twenties. It all started with the Lily Munster look – a few white hairs started to turn into a streak and I immediately started paying for lots of streaks. I started getting my hair “frosted.” Remember that term? It was slick marketing. Madison Avenue knew right were to hit us. The Don Drapers skillfully tied having beautiful hair to the dessert that never ages: Cupcakes. What tops this ageless delight? Frosting. As imperfect humans wanting to feel good about ourselves, we fell prey to the vultures, our limbic brains kicked in to help us survive what we perceived to be our withering youth. Frosting = cupcakes. Cupcakes = good. Frosting = good. Good = young. Young = good. We were hooked, we had to score the next hair-high. It didn’t matter how painful it was (remember having your hair pulled through the pin-size holes of those plastic caps with a tiny crochet needle?) or how much it cost (almost half of a car payment), we covered up the gray because we believed we should be ashamed of it. We believed that by having gray hair, we were lacking youth and by lacking youth, we were not enough. With time the plastic caps gave way to aluminum foil and while a whole new market opened up for Reynold’s Wrap, we heard the same old message: You are not enough. We don’t fight gray hair any more. We celebrate it. Along with the silver… and the white. The first time a woman 30 years my junior come up to me and asked, “Who does your hair?” I was stunned. I actually thought she was making fun of me. Puzzled, I replied, “God.” Then I realized she was paying me a huge compliment. 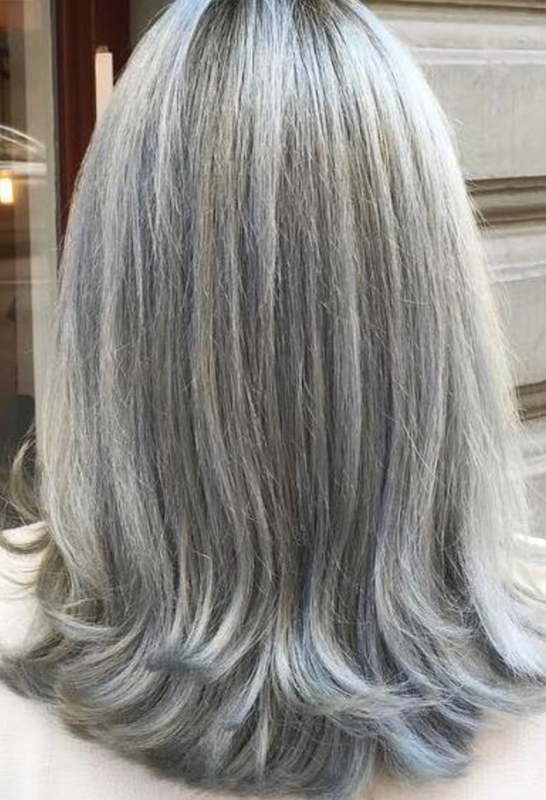 She WANTED gray hair. I hated to tell her I had earned every strand. And, so have you – with every broken heart, broken promise, and broken dream. Every painful decision, every loss… the loss of our youth, our parents, our careers… the death of our family pets. Every painful change… changes in our bodies, our marriages, our friendships, our relationships with our children. Every frustration of not feeling heard, of feeling stuck, of not knowing what to do. Every helpless feeling every time our children got sick, or a friend lost her spouse, or our spouse lost a job, or the bills outweighed our paycheck. Our gray hair is a badge of honor, a rite of passage. Life may have knocked us down, but we get back up again because, as women, that’s what we do. We get up and we get moving because let’s face it, life doesn’t stop just because things go awry. Sometimes it seems as though we take one step forward and two steps back, but we know nothing lasts forever, including the tough times. So, while we love our baby sisters, it’s not their time. They can’t force the process or circumvent the pain. It’s true, there’s a trade-off: gravity is no longer our friend, but a great personal trainer and excellent nutrition can help us get our bodies back, but our baby sisters can’t get our gorgeous gray hair from a bottle. Only a wonderfully crazy, sometimes painful life can deliver these sought-after gray goods. So, what does hair color have to do with divorce? Whether you are contemplating divorce or facing one, divorce (as with graying hair) can make us feel as though we are not enough. We erroneously believe that if we were enough, things would be different. We believe if we were enough, we wouldn’t be facing this life-altering, soul-sucking situation. Hear me now, my dear Gray Girlfriend, you are enough. Divorced, or not. Don’t buy into the tall tale. Whether you’re looking forward to being single or dreading the thought, you don’t have to hide who you are. YOU.ARE.ENOUGH. It’s OK to be who you are. Not only is it OK to be who you are, it’s the only way to be. For the first time in our lives, we’re fashionable without trying. The irony is, it no longer matters to us if we’re fashionable or not, because we are authentic. We know who we are and we know we’re enough. We’ve got the hair, my dear friend, and we’re never going back. I’m gonna wash that man right out of my hair. By the way, just as successfully navigating the daunting landscape of divorce requires the guidance of divorce professionals, caring for our gray hair involves specially-created products. Colorist extraordinaire, Emmy Henderson of Salon 3747 in Raleigh, NC knows how to treat your gray hair right. Emmy helped me get off of the hi-light/low-light hamster wheel of hiding the gray and on to the super highway of LOVING my natural color. Her recommendation? Clairol Shimmer Lights, shampoo and conditioner. It’s been around for YEARS, just like us!